Located on the highest point of Cancun, The Royal Islander - An All Suites Resort offers breathtaking views of the Caribbean shoreline and the Nichupte Lagoon. With a prime beachfront setting and an impressive array of resort services, it is part of a two resort complex and guests can also use the facilities at sister club The Royal Caribbean, just a short walk away. For dining at The Royal Islander, Cayo Largo casual dining with an International menu for lunch and seafood specialties on the dinner menu is perfect. Open for breakfast, lunch and dinner. Theme nights and poolside cookouts are staged on different nights of the week. There is a terrace bar for al fresco cocktails. Cayo Largo: A serene ambiance to savor delicious seafood and international dishes. 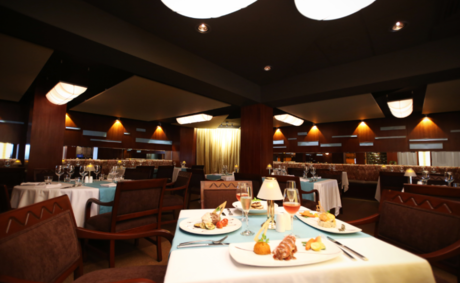 El Conquistador Restaurant: Offers seafood and international dishes in an exclusive and elegant setting. Paco’s Tacos: Now that you’re in Mexico, taste some fajitas, tacos and other Tex-Mex dishes. Captain’s Cove: One of Cancun best restaurants, offering a serene ambiance by the lagoon, seafood and international dishes. Only 5 minutes from THE ROYAL ISLANDER. Pancho & Willy’s Bar: A fun and lively ambiance is just within walking distance of its neighbor CAPTAIN’S COVE. Perfect for after dinner drinks. 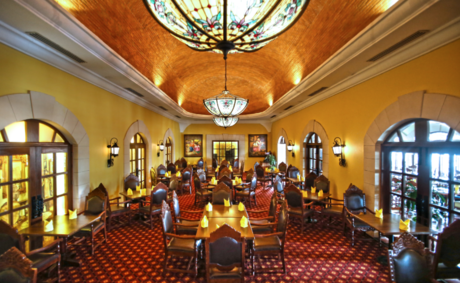 Hacienda Sisal: In a colonial Old Mexico ambiance, the restaurant offers traditional Mexican dishes, seafood, steaks and fajitas. Enjoy mariachi live music and Mexican shows over the week. Located 5 minute by bus from The Royal Islander. Tradewinds Restaurant: Just 5 minutes’ walk at neighbor THE ROYAL CARIBBEAN, taste Italian and International cuisine for breakfast, lunch and dinner in a serene ambiance. Tradewinds Express Food to Go: Stay at the comfort of your room and order roast chicken, ribs, salads and the sweetest treats to go. Bartolo’s Pizza: Have a homemade pizza with our special gourmet ingredients. Also delivers to your villa. La Cabaña Lobby Bar: A popular meeting place for friends and watching your favorite sports events, concerts and more. La Cabaña Lobby Bar also hosts karaoke nights during the week. Don't miss it! It is located at The Royal Caribbean. Royal Roast Coffee Co.: Your blood type is “coffee”? You won’t be able to handle the smell of our coffee shop. Sip at any moment. Located 5 minute walk at neighbor resort from The Royal Islander. Pool and beach bars: Order your favorite cocktail while enjoying every delightful moment by the beach and pool. For children aged between 4 and 12 years. If you would like to spend a morning at the Spa, on the golf course or just relaxing, take them to the Kids Club where they will make new friends as they enjoy supervised games, crafts, sports and more (additional fee for certain crafts may apply). Please note that for guests’ stays crossing a Saturday night might need to change rooms. Should this be the case, The Royal Islander will assist guests in order to make this an uneventful process. 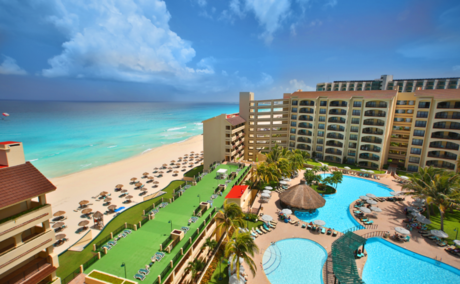 The Royal Islander All Suites Resort is an ideal Cancun lodging choice for your trip to Mexico. With numerous amenities for guests such as car rental, children's play area, beachfront, you will wake up at The Royal Islander All Suites Resort feeling refreshed every day for your time in Cancun. Don’t let this amazing reservation opportunity pass you by, book your stay at The Royal Islander All Suites Resort today to make the most of your time in Cancun, Mexico. Nestled on the beach in Cancun.